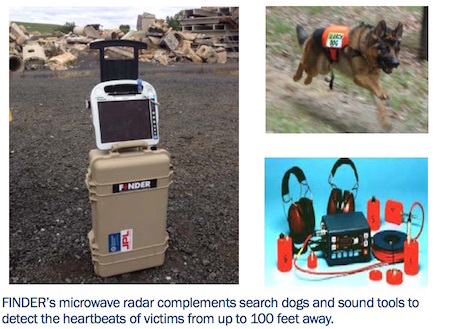 NASA's FINDER (Finding Individuals for Disaster and Emergency Response) technology uses microwave-radar technology to detect heartbeats. NASA has deployed FINDER to Nepal to assist in hunting for survivors in the wreckage following last week's catastrophic earthquakes. The men had been trapped beneath the rubble for days in the hard-hit village of Chautara. David Lewis, president of one of S&T's commercial partners, R4 Inc. out of Eatontown, N.J., arrived in Nepal with two prototype FINDER devices on April 29 to assist in the rescue efforts. He joined a contingent of international rescuers from China, the Netherlands, Belgium and members of the Nepali Army in Northern Nepal. Using FINDER, they were able to detect two heartbeats beneath each of two different collapsed structures, allowing the rescue workers to find and save the men. Even when FINDER’s signal must pass through several feet of rubble and building debris, it is able to distinguish be- tween human, animal, and mechanical movement. It can al- so distinguish between multiple victims, since each person’s breathing and heartbeat patterns are different. Cueing on heartbeat and breathing allows unconscious victims who are unable to communicate to be found. FINDER can be set up from as far back as 100 feet from a rubble pile and can provide search results in less than a mi- nute. FINDER can then be moved to a new location and used to conduct another search—thereby allowing large ar- eas to be searched quickly. Read more at JPL and FINDER (pdf). Thanks to @Nyrath (Winchell Chung) for the twitterific tip on this story.